Prab Kaur is the Office Manager at The Elite Financial Network, Inc., managing the office and ensuring the firm runs smoothly on a daily basis. Extremely well-versed with all standard operating procedures of both the firm and industry, she supports more than 35 financial consultants in compliance and advertising. 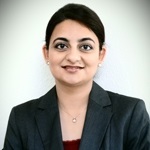 Prab originally began her career in 2008 as a financial planner assistant. She received her Bachelor of Arts in Finance with a minor in economics from California State University, Fullerton . She currently resides in Riverside, California with her husband, Dr. PD Singh daughter Keerit and son Gurmehar.